If you own an Airbnb property or manage multiple, you know the trials and tribulations that can come along with traditional lock and key style properties. From traditional homes to multiunit properties, transitioning to keyless locks can save you a ton of time headaches with all of your rental and Airbnb properties. Not only does going keyless give your renters the knowledge that they are safe in their rental property, but it simplifies the overly complicated key exchange that comes along with Airbnb rentals. Going keyless has never been easier thanks to the expert staff at GoKeyless. Going keyless with your Airbnb property is one of the best ways to streamline your rental process. By updating your locks and your smart home technology, you can earn better reviews and in turn book additional and return rentals. Simply by updating your locks, you can increase the value of your rental, bringing in more money per renter and saving you time overall. If you are interested in upgrading your locks, trust a team that has sold over one million locks and has been in business for decades. We pride ourselves in providing the best smart home equipment all across the country. You can trust the elite teams here at GoKeyless to get the job done right the first time and get you up and running quickly. The August Smart Lock is a fully customizable way for you to access and give access to your property’s security system. All of this information can be accessed via your phone or a smart device and can give temporary keys to renters, friends, and maintenance and cleaning services. August Smart Lock can also be programmed to automatically lock behind you, unlock when you arrive, and you can even keep your old keys. This system is the perfect mixture of cutting edge tech compatible with tried and true mechanisms. The Nest X Yale Lock is the meeting of two great minds in the home security industry. Nest has become synonymous with smart home technology with their comprehensive suite of tech options to make your home security system as easy to interact with as it is smart. Yale, on the other hand, has been one of the most prominent home and business lock companies for decades. These two companies have come together to make a beautiful keyless lock that is functional, stylish, and easily accessed via mobile. 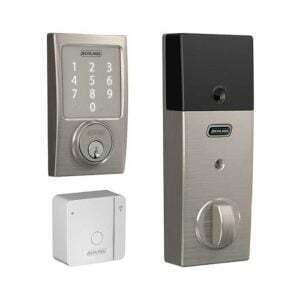 When you will be away from your property a good portion of the time and need the ability to schedule guest access at the drop of a hat, look no further than the Schlage Sense BE479 with WiFi Adapter Bundle. This starter kit includes a free app for adding and deleting codes so your AirBNB rental is accessible and secure. When you are managing your rental remotely, one of the biggest questions to ask when it comes to your lock is battery life. You want a lock you can rely on to work when you need it to. Nothing is more infuriating when a guest arrives and their code won’t work because the lock won’t wake up. Pure and simple, the Schlage Sense battery outlasts other electronic lock’s batteries by a wide margin. Typical usage is 2-3 years but we’ve heard of even more. A low battery indicator will even appear in the app to let you know when it’s time to install new ones. If you own or manage an Airbnb property, you know the importance of a great and intuitive lock system. Not only will a great lock and security system make your property more appealing and safe to your potential renters but it can save you time and energy. There is nothing worse than having one of your keys lost, or worse, stolen, and having to replace all of your locks unnecessarily. Save yourself time and money by trusting the expert team at GoKeyless to get you the best products on the market!